How can industry, universities and students work together to address the business analytics skills gap? I was fortunate to speak on this topic at the 2015 T-Summit at Michigan State University in March. Demand for business analytics skills has increased sharply in just the past few years, with the rise of powerful analytics tools and Big Data. Companies today need business analytics skill sets at every level and in every department. Organizational demand for people with business analytics skills is increasing, while at the same time, more people are leaving jobs than coming in – and that’s a problem. While companies look to universities to increase their pools of analytical staff, business leaders consistently report that there is a yawning gap between the skills that are required and the training that most academic institutions provide. Currently, higher education is producing I-shaped graduates, or students with deep disciplinary knowledge. 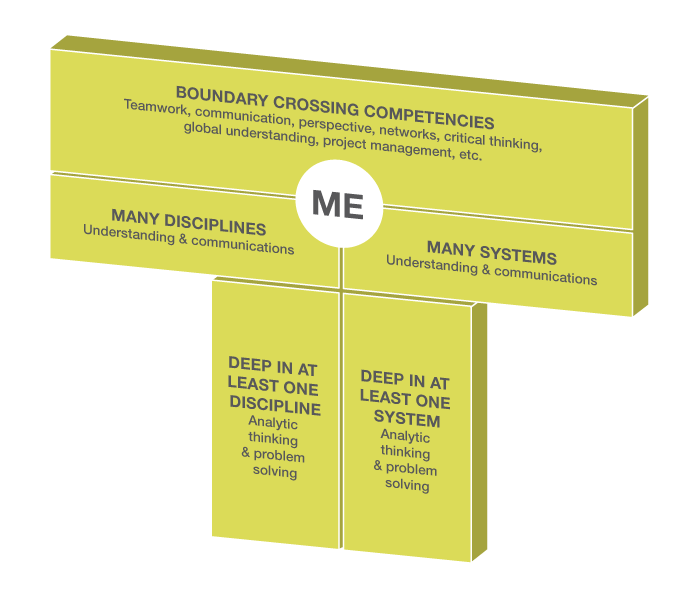 As I’ve noted before, T-shaped professionals are characterized by their deep disciplinary knowledge in at least one area, an understanding of systems, and their ability to function as “adaptive innovators” and cross the boundaries between disciplines. Responsibility for training graduates is often mistakenly seen as belonging to universities. But businesses are in an essential training role through internships, mentoring, and on-the-job training. Likewise, businesses need candidates with more than just a degree, but who are actually qualified for the positions they are seeking to fill. – Encourage strong and collaborative partnerships between universities, placement offices and businesses. Course offerings should foster the T-shaped skills that hiring organizations demand. – Create, support and manage robust internship and mentoring programs that include students in curriculum planning and emphasize the enhancement of T-shaped thinking. These suggested improvements can help corporations and universities to become better partners in providing students with most effective training for tomorrow’s workplace. At this year’s T-Summit, Jeff Selingo, author of “College Unbound,” shared his findings about some of the innovative approaches underway right now to close the skills gap. I highly recommend watching his presentation, which is included below.